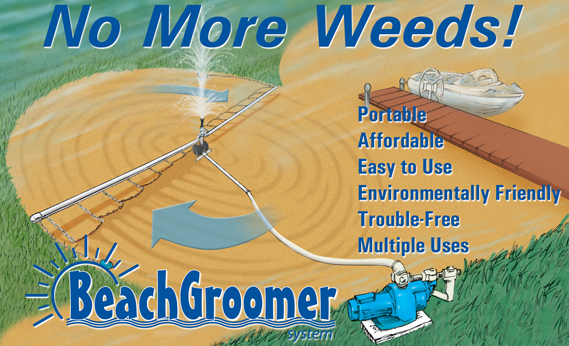 The BeachGroomer is unique and provides you with a way to effectively remove and keep away unwanted weeds, debris and muck from the water and beach area. It does not require any electricity to run and is portable so you’re able to bring it wherever clean up is needed. It is a free standing unit and the only one that is out there. It only weighs 20 pounds and comes with wheels so you’re able to easily wheel it to where it needs to go. The 100′ flexible hosing is 1 ½ inches offers many different mobility choices when cleaning up the area. It is affordable, effective and you never have to worry about safety issues because it does not need electricity in order to run! The Beach Groomer comes with many different parts that you can make use of when it comes to using it for cleaning up around the beach. 2 seven-foot arm units that come with galvanized chains connected to them, 2 50 foot lengths of 1.5” flexible PVC hoses that have quick connects, swivel assembly complete with wheels, pump attachment kit, fountain head that is able to spray up to 25 feet and a 1 inch flow control valve for the fountain head, 2 port covers so you only have to use the fountain, 3 different extensions to place in specific depths of water, one irrigation pump, a pump mounting base that is made from HDPE plastic and comes with the mounting bolts, a pump that is wired for 110V or 220V (your choice), 33 feet of 2 inch suction hose that has quick connects, 2 inch check valve and a 40 gallon Big Foot filter with stand. Everything that you need to clean the water and the beach is included with the deluxe set that will get you started.